Please tell me this is not real sized! It’s real sized. It ate a small kitten prior to this picture. oohh, gross! i had that problem once, too. YUCK! 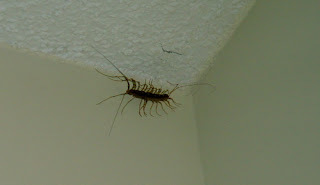 I believe I killed that very zillapede with my own two hands and a broom- oh while I was wearing an eye mask.